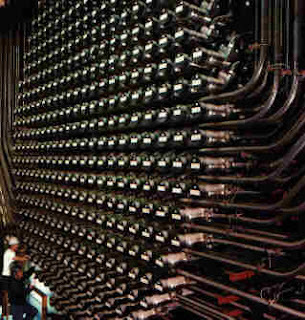 The Candu reactor design uses fuel rods inside a pressure tube. This has proved reliable and surprisingly flexible. Thus we have the welcome notice of collaboration between the Chinese and Candu to advance the application of the Thorium fuel cycle on the Candu platform. This is way below the radar as yet, but the Thorium fuel cycle system appears to be on the way to ultimately displacing the Uranium fuel cycle systems we presently rely on. This is a decadal shift but will continue even if fusion does replace fission which I presently expect. The reason is quite simple. We have a serious mass of fuel material that needs to be reduced to something that is safe. This includes every bomb made and every uranium fuel rod ever manufactured. The Thorium cycle allows all radioactive components to experience accelerated decay inside a neutron rich environment. It is pretty close to been a perfect fix at least on paper. This is now all about doing the engineering right. It may still require centuries to consume all the fuel derived from the Uranium cycle that is available but there will be a clear road forward and an end game presently unavailable. It even consumes Plutonium. 1.Mining Weekly - India’s Department of Atomic Energy (DAE) would permit private miners to process beach sand and supply monazite tailings to the government-owned Indian Rare Earths Limited (IREL) to increase the latter’s capacity to extract thorium and uranium. At present, private miners were allowed to extract rare earths from beach sand but not process radioactive monazite, which, under the Atomic Energy Act, was categorised as a ‘prescribed substance’ and the sole domain of the government. Private miners were forced to stockpile beach sand with monazite content higher than 5% at their own cost or put it back into the mine if monazite content was lower. According to an official in the Mines Ministry, the DAE proposed to make amendments to the Atomic Energy Act so that beach sand miners could hand over the monazite tailings to IREL for further processing into thorium and possibly uranium, if economically feasible. The DAE hoped to secure supplies of at least one-million tons of thorium from beach sand processed by private miners, and increase the supply of monazite to IREL. Data from the Atomic Mineral Directorate for Exploration and Research has shown that India’s monazite reserve was estimated at 10.70-million tons. The province of Andhra Pradesh accounted for the largest reserves estimated at 3.74-million tons, followed by Tamil Nadu with 2.16-million tons, Orissa with 1.85-million tons, Kerala with 1.51-million tons, West Bengal with 1.22-million tons and Bihar with 0.22-million tons. 2. India's Atomic Energy Commission (AEC) is working hard to develop the next generation reactors that can use thorium as a fuel, said its chairman R K Sinha, who is also the union secretary at department of atomic energy. Sinha said, "Nuclear energy is quite relevant and essential too. However, compared with other countries, we are left with less quantity of uranium with us. But, we do have thorium with us. The only issue is that it cannot be used directly as a fuel as it has its own limitations. Hence, we are planning to use plutonium during the second phase of nuclear energy programme. But, we will start working on the use of thorium during the third phase of the nuclear energy programme of the country." 3. Candu Energy Inc. has signed an expanded agreement with China National Nuclear Corporation's subsidiary companies, Third Qinshan Nuclear Power Company (TQNPC), China North Nuclear Fuel Corporation (CNNFC) and Nuclear Power Institute of China (NPIC) to continue co-operation in the development of recycled uranium and thorium as alternative fuels for new CANDU® reactors. With a 24-month duration, the agreement is expected to result in a detailed conceptual design of the Advanced Fuel CANDU Reactor (AFCR). The AFCR is a further evolution of the successful CANDU 6® and Generation III Enhanced CANDU 6®, which is optimized for use of recycled uranium and thorium fuel. The agreement follows the successful demonstration irradiation of recycled uranium fuel bundles in operating CANDU reactors at the Qinshan site, about 150 km southwest of Shanghai. The tests demonstrated the feasibility of using natural uranium equivalent (NUE) fuel, composed of recycled uranium and depleted uranium in CANDU reactors. The parties are now working on a project to convert the Qinshan CANDU reactor units to full core use of NUE fuel by 2014. The agreement marks the third phase of cooperation between Canada and China. Beginning in 2008, it demonstrates not only the use of recovered uranium but also thorium in CANDU reactors and serves as evidence of Candu's commitment to customer driven partnerships and the CANDU reactor's inherent capability to use alternative fuels. This CANDU flexibility offers a unique opportunity to realize closed fuels cycles in countries that have both CANDU and LWR reactors. "CANDU technology can make a major contribution to reducing China's dependence on imported nuclear fuel resources," said Frank Yee, Candu's Chief Nuclear Engineer. "China has abundant thorium resources, and can use recycled uranium in the most efficient and cost effective manner in our commercially proven reactor designs with minimal changes."